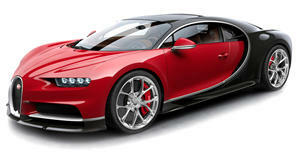 When Lego decides to do a Bugatti, they pull out all the stops for a truly masterful set. Lego and Bugatti have issued a Lego Technic series that will go on sale for $349.99 beginning today at Lego locations around the world and online. Reducing such an exclusive machine to 1:8 scale is fraught with challenges, but if the photos are any indication, it captures the spirit of the design in its signature duo-tone blue color scheme, delights with authentic details and offers fans of the brand a way to bring the ultra-luxury exotic hypercar into their lives and living room. Bugatti as a brand and its $3-million Chiron are on a tier above even exotic brands like Ferrari, Lamborghini and Rolls-Royce, so it’s slightly unexpected and exciting to see it reimagined as Lego and made available to us mere mortals. To recap, the is so fast, it laughs at puny 0-60 mph times as its 1,500-hp 8.0-liter 16-cylinder quad-turbo engine, 7-speed dual-clutch, and all-wheel drive system can get it to 62 mph in 2.4 seconds, 124 mph in 6.1 seconds, 186 mph in 13.1 seconds, and 248.5 mph in 32.6 seconds, and . Introducing the new model at Lego’s global headquarters in Billund, Denmark, were Lego Group CEO Niels B. Christiansen and Bugatti President Stephan Winkelmann. Christiansen captured the excitement we’re probably all feeling at the prospect of building our very own Bugatti: “I am very excited about this new model. Our Lego designers have done an amazing job capturing the details of this iconic Bugatti design. It’s a huge model that I can’t wait to start building myself. I’ve always been passionate about engineering and this model’s details and design are truly fascinating.” Huge is relative of course, as the 1:8 scale Technic set measures 22 inches long, 9 inches wide and over 5 inches high when the 3,599 pieces are assembled. However, it’s hard to say whether the immersive detail, working parts and finishing touches are more exciting than the joy of assembling such a complex machine (with all the pieces in the right places). Some of the unique flourishes for this model include an active rear wing, spoked rims with low-profile tires, detailed cockpit with movable paddle gearshift, and the W16 engine with moving pistons.